Beyond these, there are also plenty more old forts to explore, though those included above may well be enough to satiate most dark tourists' appetite for viewing fortifications. There's also more to explore underground, including yet more wartime shelters. But arguably the most celebrated troglodyte attraction on Malta is the so-called Hypogeum (or, to give it its full name Hypogeum of Ħal-Saflieni). It's an ancient subterranean necropolis (“hypogeum” is simply Greek for 'underground'), some 7000 years old, but it was accidentally rediscovered only in 1902 by construction workers. It subsequently became quite an archaeological sensation. In recent years it has seen a substantial restoration project and is now much better protected than before (climate-controlled, for instance, to preserve the delicate wall paintings). However, this also means that visits to the site are strictly controlled and limited to only a handful of guided tours per day of max 10 participants each. So pre-booking ahead, preferably a few weeks in advance (!! ), is pretty much essential (you can pre-purchase printable tickets for any available slots online). When I was there waiting for my tour to commence I saw at least two dozen people who just walked in and had to be turned away (the only thing you can see without a reservation is the video presentation that precedes the guided tour, but you can't see the real thing in the flesh). So be warned. Also, it's not cheap: 35 EUR per person (20 EUR for students and seniors)! That's for a one-hour guided tour. To get there you can take bus lines 82, 84, or 88 from Valletta bus station and get out at “Ipoġew” (which actually means 'hypogeum' in Maltese). From the bus stop walk back in the direction you've come from and turn left into Triq Hal Luqa and then left into Triq Ic Cimiterju and follow the signs. Since there is a strict (and policed) no-photography rule in place inside the Hypogeum, I can't offer any images for the gallery below. But you can easily enough find some online elsewhere. Not far from the Hypogeum, ca. 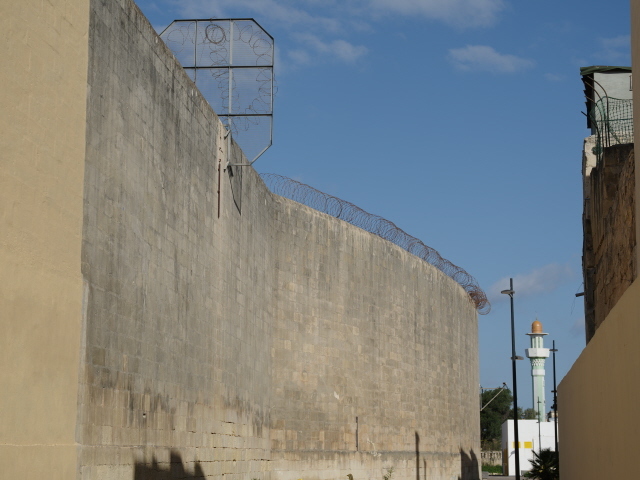 600 yards to the north, on the main road through the district of Paola, Triq Il Belt Valletta, is the old Corradino prison complex (also known as Kordin prisons). One part of it that dates back to the British Royal Navy presence on the island is apparently open to the public (the part I saw clearly was not, but seemed to be still in use as an active prison – going by all the security and barbed wire atop the walls). At least the VisitMalta website lists it as one of the tourist attractions, yet gives very scant information. I was not able to obtain any info regarding opening times or admission prices either, and the site's Facebook page makes it look more like an events location of sorts. Yet there is a “gastro pub” (called Pavilion) in the main gatehouse just off Telgha Ta Ras Hanzir. That at least should be open regularly. Those into military history and aviation could also put the Malta Aviation Museum on their to-do list. This has a few WWII-era planes but also some post-WWII/early Cold-War-era aircraft such as a Gloster Meteor. It's located in the village of Ta' Qali, halfway between Mosta and Mdina/Rabat, and can be reached by bus, e.g. by line 56 from Valletta, to the stop 'Stadium' (the national football stadium is right next door). For those visiting by car there's a free car park. Admission is 7 EUR, opening times: daily 9 a.m. to 5 p.m. (last admission 4 p.m.), closed on public holidays, and seasonally weekend opening times may be shorter … which is also why I missed it (hence no separate chapter and no photos). 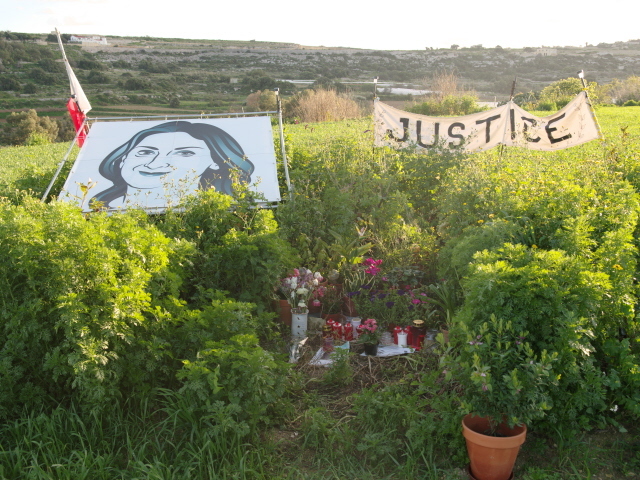 A much more contemporary dark place that is completely off the institutionalized tourist radar is the assassination site of Daphne Caruana Galizia. She was an investigative journalist who had been looking into Maltese politicians' involvement in various murky dealings, including the Panama Papers, and various issues of corruption. For this she had been threatened before (including the killing of her dog!). Then on 16 October 2017, at 3 p.m., she died in a car-bomb attack just outside her home village of Bidnija … a murder in true old-school Mafia fashion! A bomb had been planted under the driving seat and was set off remotely as the car left the village. The assassination caused an international outcry, but the campaign for justice for Galizia has so far still not come to fruition. Even though some suspects were arrested, they haven't yet been brought to trial. But now let's look into Malta's long history before those recent events. And Malta does indeed have quite some history! So much so that only a very brief summary can be given here. Suffice it to say that Malta's history goes way back into prehistoric times (some temple relics are said to be amongst the most significant of that age in the world), then there were phases of Phoenician and Carthaginian and Roman rule, an alleged visit (involuntarily – by shipwreck) by St Paul (see St Paul's), a period of Byzantine then Arab rule, and the return to Christianity by way of the Normans and the Spanish “Reyes Catolicos” ('catholic monarchs'). 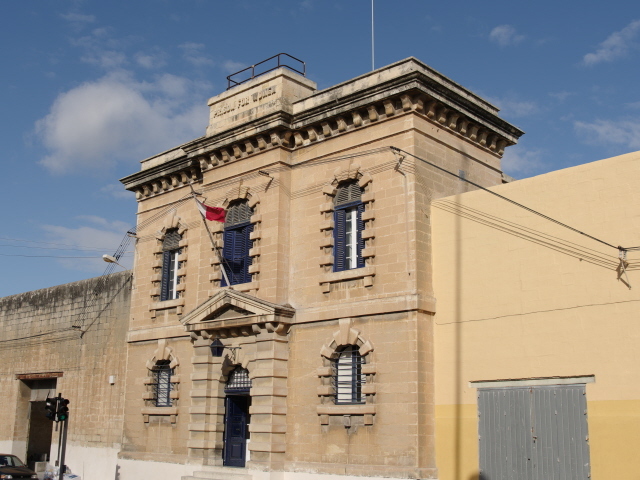 The then homeless Order of the Knights of St John – originally of Jerusalem – was eventually granted the lease of a new home on Malta in 1530, when they had to leave their exile on Rhodes, Greece, as the Ottoman Empire expanded. However, it didn't take too long for the Turks to reach them again, this time laying Malta under siege in 1565. The victory against the attacking Ottoman Empire is one of the defining historical hero narratives in Malta to this day. 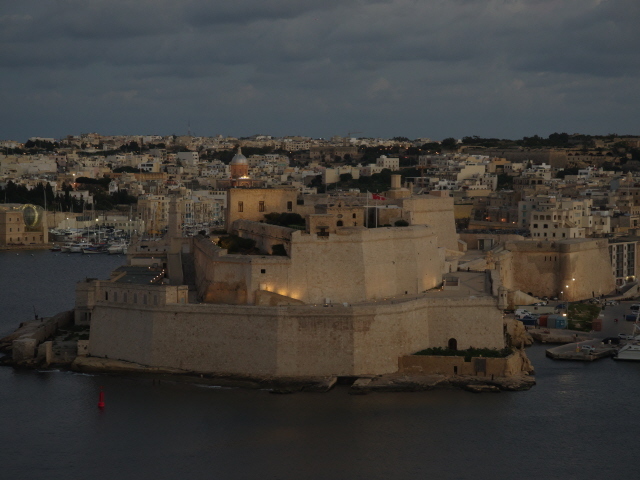 Following this was the beginning of great prosperity, with the building of massive fortifications, including the foundation of the island's newly built capital, Valletta, named after the then leader, or 'Grand Master', of the Knights. Grand palaces were also constructed and many high-ranking architects and artists were commissioned to design and embellish them. Following a slow decline of the Knights' rule, Napoleon of France (cf. St Helena) took an interest in Malta and briefly occupied the island from 1798 until the French themselves were ousted by the British. From 1800 onwards Malta became part of the British Empire and underwent a period of anglicization that is still evident to the present day (just look at those red phone boxes). The takeover by the British had far-reaching consequences (to be fair: the Maltese preferred British rule over the Knights' or Napoleon's, so it wasn't exactly an aggressive act of colonialism, but more like an invitation). This included not only further military fortification (cf. Fort Rinella, for instance) but also modernization of infrastructure that the general civilian population benefited from as well. During World War One, Malta wasn't involved in military action in the form of battles itself but was nonetheless of great significance, namely by providing some 25,000 hospital beds and treatment for the wounded of the battles elsewhere, in particular Gallipoli in 1915. This earned the island the epithet “Nurse of the Mediterranean”. In the inter-war years some first steps towards a degree of self-government and a constitution were undertaken, but militarily Malta remained an important strategic base for the British, lying roughly halfway between their outpost in Gibraltar and British possessions in Egypt/Palestine. With the outbreak of WWII, dictator Mussolini of Italy decided he wanted to try and seize Malta, and so on 11 June 1940 the Italian air force began a campaign of aerial bombing raids. Worse still, with the beginning of Nazi Germany's engagement in northern Africa (with Rommel's Afrika-Korps), Malta suddenly became strategically important to Hitler too, and so the German Luftwaffe soon joined in in the ever increasing bombing raids. It is often claimed that Malta was the most bombed place of the whole war – sometimes it's referred to as the “Blitz of Malta”. The destruction caused by all this was substantial, and so were the deprivations suffered by the civilian population of course. Many sought refuge in underground tunnel systems that were either already existing or quickly dug into Malta's soft rock. Several examples of these are today open to tourists (see above). Likewise the military command assumed underground shelter – see the Lascaris War Rooms. Yet, Malta survived this modern-day “Second Siege” as well, the British upped their defence and managed to get just about enough supplies to the island to ensure its survival. All this was celebrated in a specially commissioned film that was screened in cinemas back in Britain – and these days is shown in almost every war-related museum in Malta. The war fortunes turned against the Axis powers from 1942 and especially with the defeat of the Italians and Germans in northern Africa. In 1943 Malta then became the springboard for the Allied invasion of Sicily, after which Italy surrendered in September (only to see its northern half subsequently taken over by the Germans … but that's another story – see under Italy). 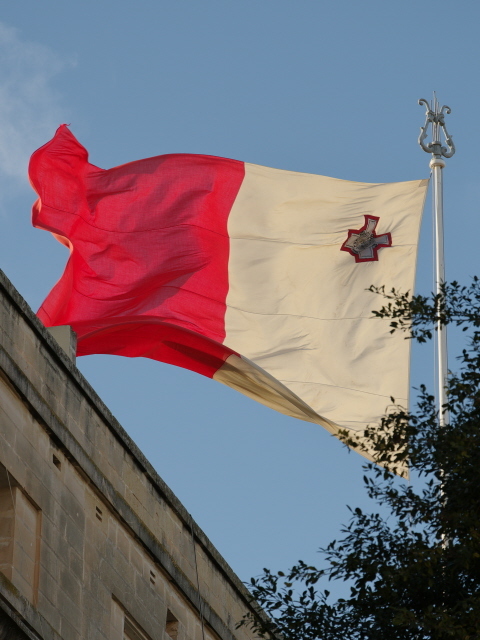 For its resilience and bravery in the war Malta was awarded the so-called George Cross (named after then King George VI), which still features in the national flag. Beyond this symbolic recognition, the country was also given practical support, namely substantial sums of money for reconstruction and repair of wartime damage. It also remained the main British/NATO naval base of the southern Mediterranean for the next few decades in the Cold-War era (see the War Tunnel Tour). Yet within just something like ten years after the war, calls for independence became louder in Malta, and indeed in 1964 full independence was granted, though the British military retained its naval base until 1979, by which time it had largely lost its strategic significance and the British closed it down and went home (initially this was economically quite a blow to the island's economy). Subsequently Malta pursued a path of neutrality and non-alignment and hence shunned NATO. However, after the British departure, the country began looking more and more towards Europe and applied for membership in the European Community in 1990. In 2004, full EU membership was attained, and Malta joined the Eurozone in 2008. All this further helped with the modernizing of the country. (Though it remains a very religiously conservative place – divorce was legalized only in 2011, and abortion is still illegal!). 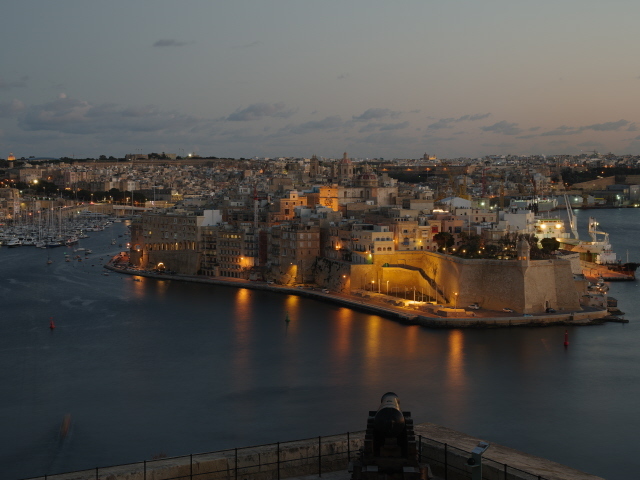 In 2018, the nation's capital Valletta took its turn as “European Capital of Culture”. But as the assassination of Daphne Caruana Galizia in 2017 (see above) highlighted, not all is well in the state of Malta – under the shiny veneer lots of dark things lie hidden … Its role in the continuing migration crisis in the Mediterranean is another problematic issue here. But let's not get drawn too deep into politics here. 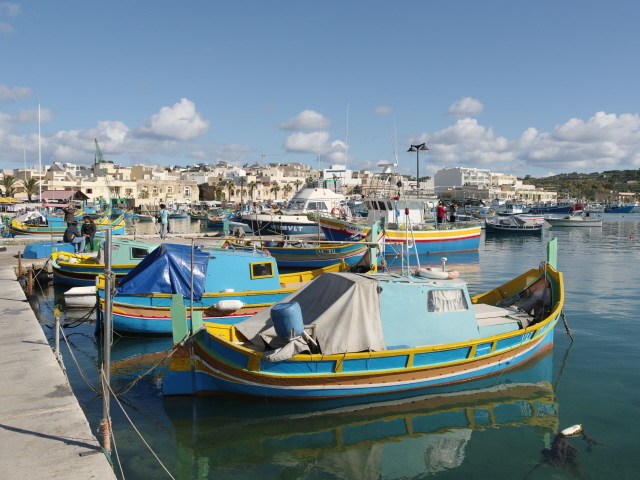 Instead let's look at some aspects relevant to travellers to Malta in general. Getting there is generally easiest by plane, and the island's international airport is well served both by Malta's own national airline (offering quite competitive rates) as well as various other carriers, including cheap budget ones such as a well-known Irish name (but I won't drop it here). The only alternative to flying in is coming by boat, and there are indeed ferry connections to Sicily, Italy. But this will probably be an option that's attractive to only few short-term visitors. 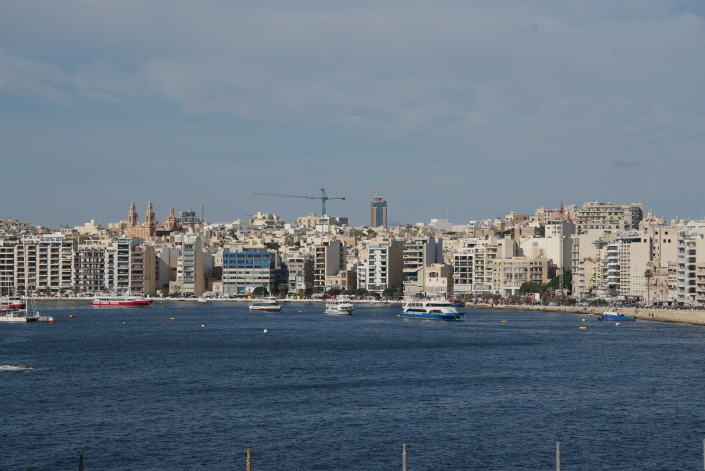 In addition the great bane of maritime tourism – cruise ships – also haunts Malta. 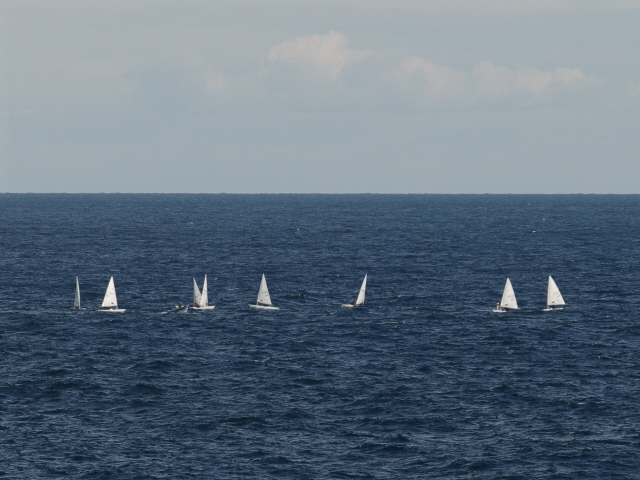 Many of these deplorable monsters of the sea call at Malta's Grand Harbour and spew out their thousands of passengers. 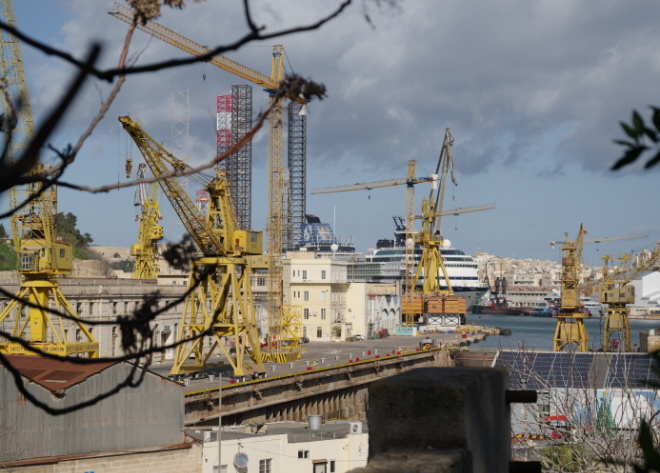 Luckily, when I was there in December 2018/January 2019, the only cruise ship moored at the Valletta waterfront left after a couple of days and no others turned up during the remainder of my stay. Getting around is easy enough thanks to an extensive and well-functioning public transport system in the form of buses. Most corners of the island can be reached that way, and fares are comparatively cheap (1.50 EUR in winter, 2 EUR in winter – flat rate for any single journey … for those who intend to use public transport a lot, reloadable electronic tickets are available). Linguistically you are faced with a funny duality: the native Maltese is a very exotic Semitic language with a writing system that is mostly Latin, yet with special characters and diacritics and to eyes accustomed to Indo-European languages looks quite bizarre (it reminded me a little of Albanian), though due to many loan words, especially from Italian, it does occasionally look and sound strangely familiar at the same time. Fortunately for foreign visitors, owing to the long presence of the British, English is a second official language and is indeed spoken practically everywhere by virtually everybody and most signage is also in English. 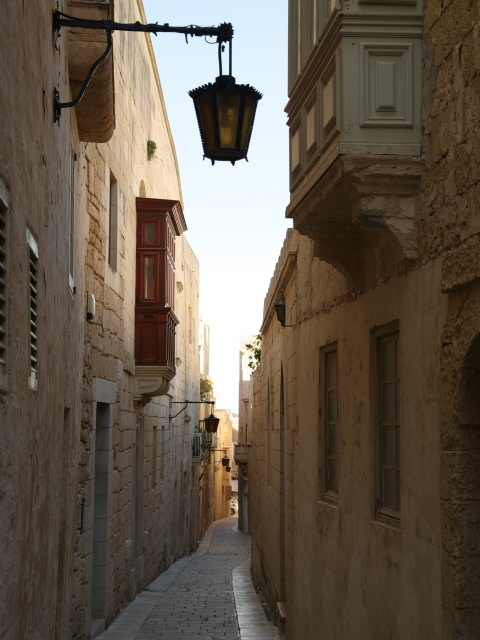 The only tongue-twisters you may have to learn, other than a number of place names, are perhaps a few common words for polite greetings and pleases and thank-yous in Maltese (actually called “Malti” in Maltese). Malta's climate is, unsurprisingly, southern Mediterranean, with very hot summers, and winters milder than in mainland Europe. Though I found it quite cold when I was there and still had to wear fleeces and coats a lot of the time. While the weather is dry much of the year, in winter you have to expect a good number of showers. Yet when I was there I was only caught out by rain twice. So it wasn't so bad. 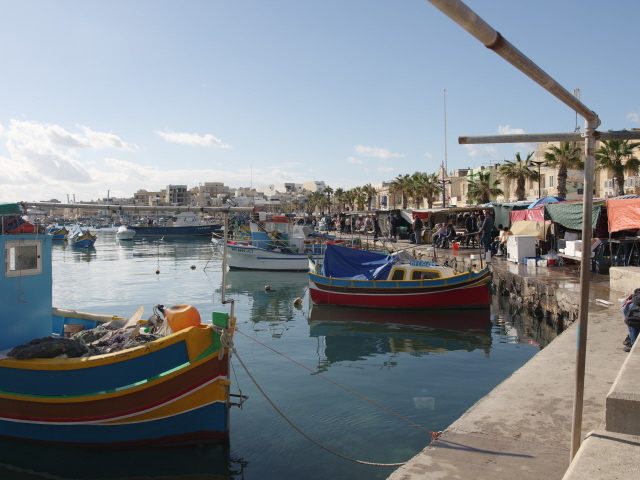 Accommodation options are plentiful, thanks to Malta being such a popular general tourism destination, and if you go off season, some good deals can be found, even at relatively up-market places. At peak times, though, prices go up, as I found out for New Year's Eve and New Year's Day when rates were expensive everywhere. Food and drink deserve a special mention. The Maltese traditional cuisine has seen quite a revival in recent years and is characterized by both noticeable outside influences, especially from Sicily/Italy plus northern African/Middle Eastern hints, but also features several idiosyncratic elements of its own. The No. 1 national speciality is rabbit stew, but lovers of fluffy animals and vegetarians need not despair. There are also plenty of non-meat alternatives, including another everyday staple: little pastry parcels called “pastizzi” that come filled e.g. with ricotta cheese, mashed peas, or other things. They make for wonderful, and affordable, street food snacking. Traditional Maltese bread is excellent and a delicacy in its own right with just a bit of olive oil, or dipped into the ubiquitous bean spread called “Bigilla”. Local cheese is made primarily on the neighbouring island of Gozo (also part of the nation of Malta) and takes the form of little round “cheeselets” that often come with a dusting of cracked black pepper or herbs. Pasta is very popular, and to top the general stodginess of Maltese cuisine there's “Ftira”, which is either a filled loaf of bread or something more akin to pizza, but with often quite different toppings than you'd expect of pizza. On the drinks front, Malta is a notable wine-growing region (though hardly for export), and the quality has increased over the past couple of decades (heat-loving grape varieties like Chardonnay and Cabernets grow best here, but there are also other varietals to try). More recently, the craft beer scene has arrived in Malta, in particular at one brewery on Gozo, but you can find local brands in Valletta too (imported Italian and British brands are also to be found). Much more readily available is an omnipresent Maltese industrial bland lager brand for those less discerning, but also some more British-style pale ales. Stronger tipples come in the form of various liqueurs made with local ingredients such as fennel. At the other end of the scale, Malta's own soft drink brand is called Kinnie (I never tried it, though, as I generally stay away from such unnecessary sugar water) … bottled water is widely available, and even though tap water is theoretically potable, many people say they don't like its taste (its desalinated sea water). I used to refill bottles, though to be on the safe side I boiled it first. I thought it was fine. This chapter shouldn't close without mentioning at least a few of the non-dark tourist attractions – though I cannot say anything about the more beach-resort holiday centres such as Bugibba or Ghadira in the north (I avoid such places like the plague). 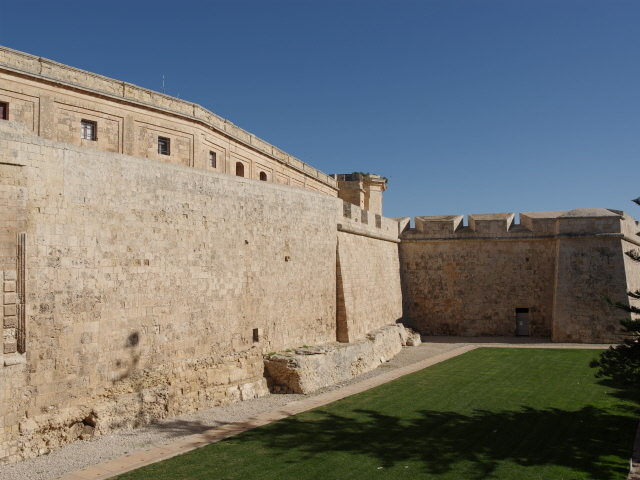 Particularly noteworthy is the old former capital of Mdina, an extremely picturesque Medieval walled city and a popular day-trip destination. Directly adjacent to it is Rabat – see under St Paul's. 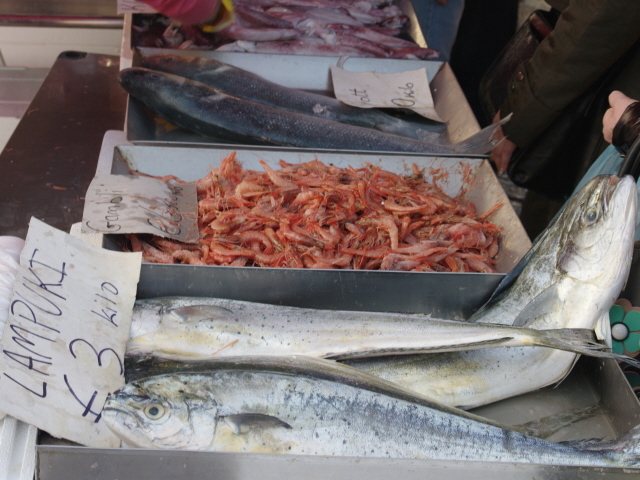 The cutely named Marsaxlokk (pronounced 'marsa-shlock') is an appealing fishing village in the south, and the venue of a regular market … originally a fish market, though these days stalls selling all manner of plastic wares and tourist knick-knacks drastically outnumber the fish stalls. 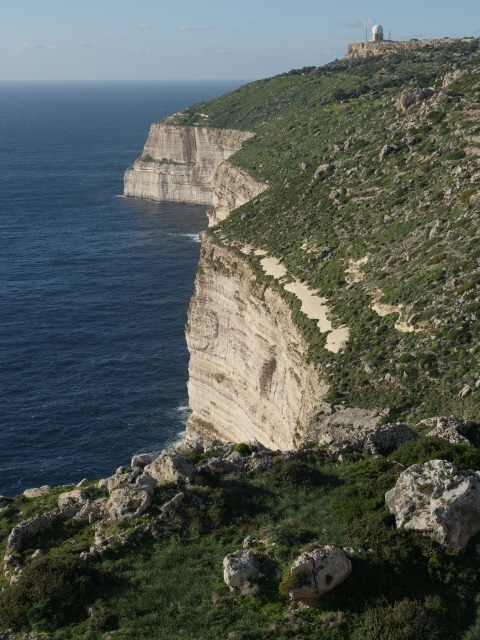 Scenic spots include a “Blue Grotto” on the south coast, and the Dingli Cliffs a bit further to the north-west. 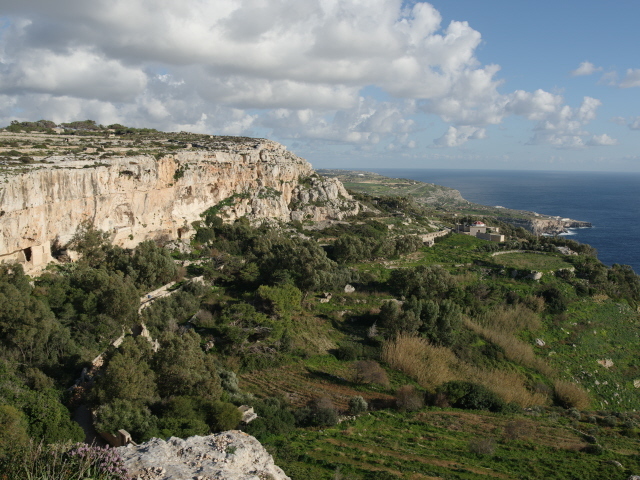 The cliff-tops are in fact Malta's highest elevation. 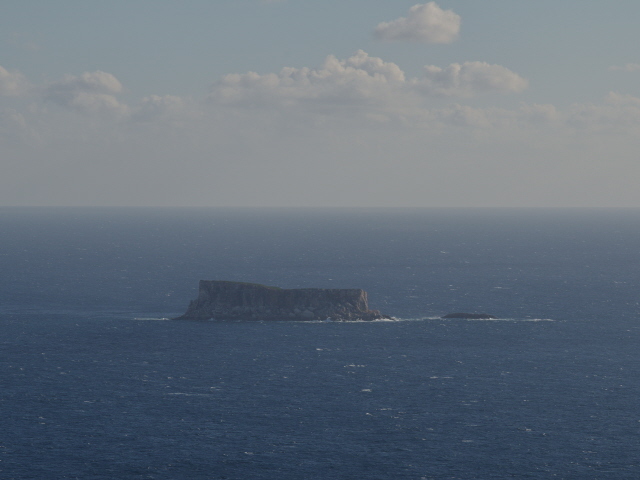 From here you can see the uninhabited island of Filfla best. 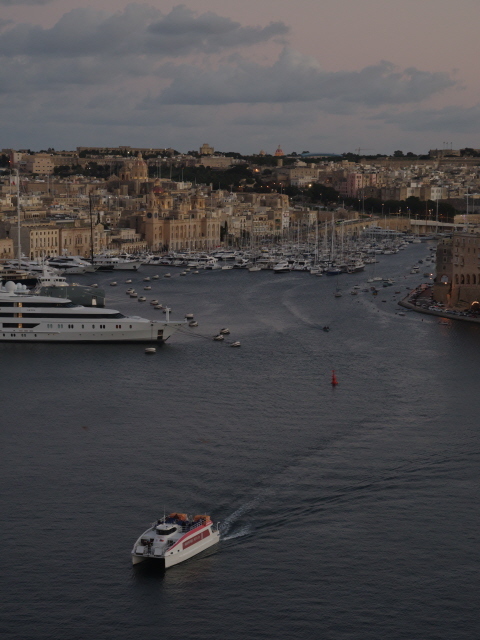 Back in the urban centre of Malta, opposite the capital Valletta are the so-called Three Cities … see under Vittoriosa.